← What kind of name is that? The coffee matters, but so does the barista. 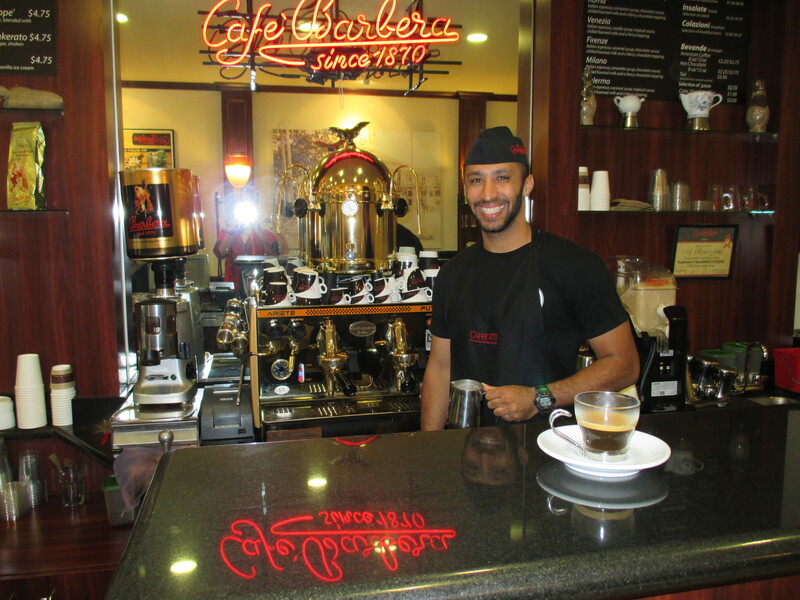 Cafe Barbera, Italy’s oldest coffee company (since 1870, in case you were wondering about the café name), roasts a powerful espresso bean. But Ryan, the barista, knows how to create a perfect macchiato (or espresso with a bit of foam…I don’t know about you, but I’m still learning these terms). I normally drink a strong black coffee, but will try what a coffee shop is known for & Ryan directed us both to an espresso drink. My coffee advice: always take the advice of the barista! Advice for this particular coffee shop: bring quarters for the meters in front or have enough time to walk at least 2 blocks for unmetered parking. This entry was posted in Coffee shops in San Diego and tagged Barista, Caffè macchiato, Coffee, Espresso, Hillcrest, Italy, San Diego. Bookmark the permalink. Patty! I must try all of these! I enjoy coffee beyond all reason. And, these places look so fun. I did a review (of sorts) of Cafe Moto on my blog, I was so taken with the experience. Here’s a link, if you’re interested. http://sandandtable.com/where-have-i-been-all-my-life-part-2/ And, I’m with you: strong, black coffee is the way to go!